Covering more than one hundred years of American history, Walls and Mirrors examines the ways that continuous immigration from Mexico transformed—and continues to shape—the political, social, and cultural life of the American Southwest. Taking a fresh approach to one of the most divisive political issues of our time, David Gutiérrez explores the ways that nearly a century of steady immigration from Mexico has shaped ethnic politics in California and Texas, the two largest U.S. border states. Drawing on an extensive body of primary and secondary sources, Gutiérrez focuses on the complex ways that their pattern of immigration influenced Mexican Americans' sense of social and cultural identity—and, as a consequence, their politics. He challenges the most cherished American myths about U.S. immigration policy, pointing out that, contrary to rhetoric about "alien invasions," U.S. government and regional business interests have actively recruited Mexican and other foreign workers for over a century, thus helping to establish and perpetuate the flow of immigrants into the United States. 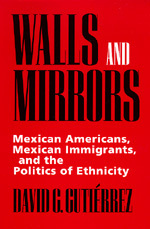 In addition, Gutiérrez offers a new interpretation of the debate over assimilation and multiculturalism in American society. Rejecting the notion of the melting pot, he explores the ways that ethnic Mexicans have resisted assimilation and fought to create a cultural space for themselves in distinctive ethnic communities throughout the southwestern United States. David G. Gutiérrez is Assistant Professor of History at the University of California, San Diego.